Senator Bernie Sanders (D) [2016 file photo]. At least five people have left Sen. Bernie Sanders’s (I-Vt.) new political group after Sanders brought in his campaign manager to lead it, Politico reported Tuesday. 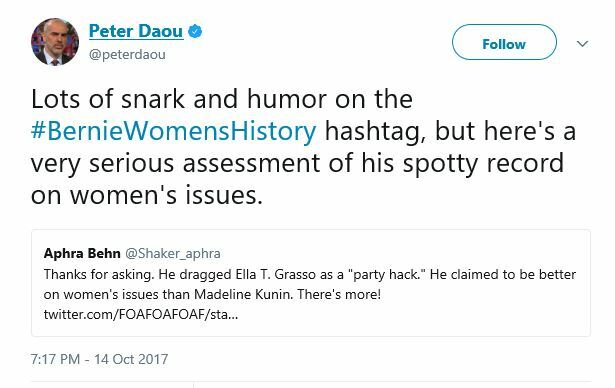 Weaver, who ran Sanders’s presidential campaign that ended last month, was made president of the group Our Revolution, causing the exodus before the group officially launches…..
….On Tuesday, July 12, U.S. 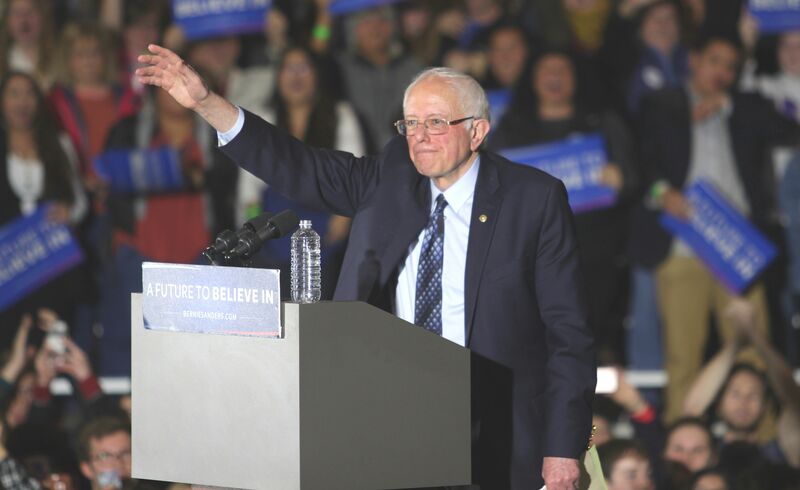 Senator Bernie Sanders will join Hillary Clinton for a campaign event at Portsmouth High School to discuss their commitment to building an America that is stronger together and an economy that works for everyone, not just those at the top…. ….U.S. Sen. Bernie Sanders on Tuesday will join Hillary Clinton for a campaign event at Portsmouth High School to discuss their commitment to building an America that is stronger together and an economy that works for everyone, not just those at the top…. You were expecting anything else? Oh, and asking permission, too. We encountered this post via a social media “share” today. The image looked familiar. At the Missouri Democratic Party state convention in Sedalia – June 18, 2016. Photo: Michael Bersin, Show Me Progress – F 2.2, 1/60, ISO 400, 50 mm. I’m getting tired of people appropriating my images without permission and attribution. You’re supposed to ask the photographer for permission and then accede to their wishes. They didn’t ask. They didn’t even bother to credit the image. Typical. ….Over the years in covering government and politics for this blog I’ve taken somewhere in the neighborhood of 100,000 images. Obviously most of those images don’t make it into a post, but a lot do. I tend to remember most, if not all, of the images I’ve taken (yes, even for that large a number) because, well, because. From time to time a newspaper, magazine or other news outlet will contact us and ask for permission to use my images for one of their stories. 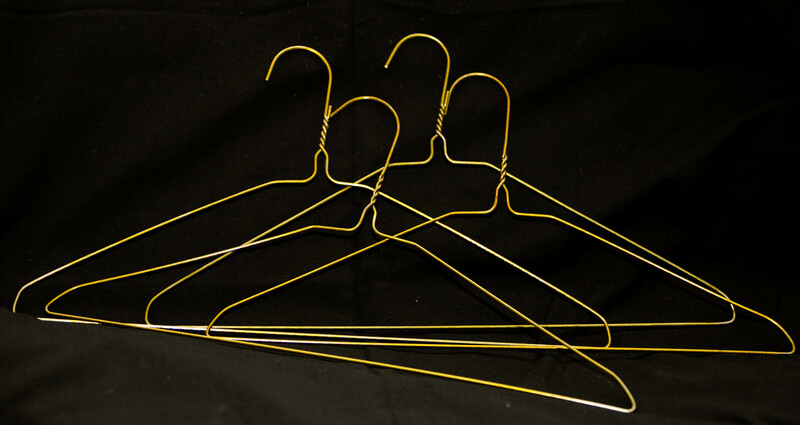 We’ve always granted such for legitimate news sources (Did you see what we did there?) provided that they credit the photographer and the blog…. 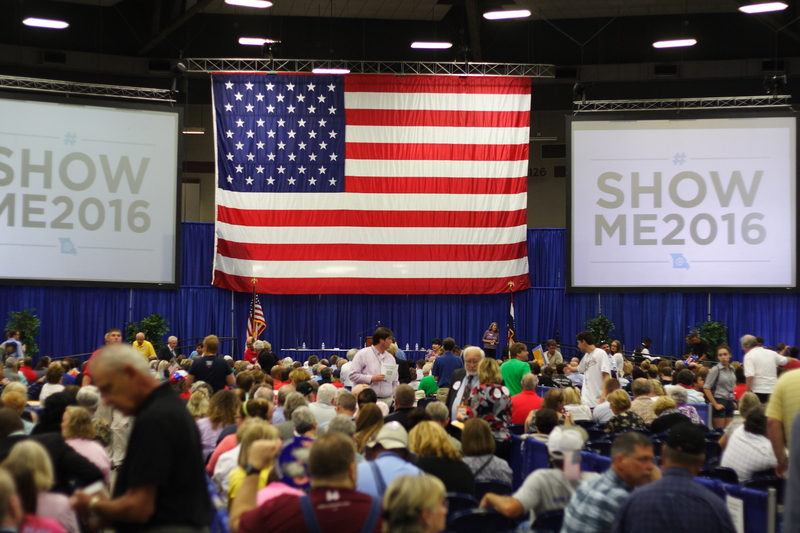 There were state Democratic Party conventions in America yesterday, including Missouri. The sole U.S. senator to endorse Bernie Sanders for president urged Democrats to unite behind Hillary Clinton at Washington’s Democratic convention Saturday, drawing boos from a crowd filled mainly with Sanders supporters. A smaller number of Clinton supporters at the state convention cheered when U.S. Sen. Jeff Merkley, D-Oregon, called Clinton the Democratic presidential nominee and urged Washington delegates to support her. “We have to come together,” Merkley said while delivering the keynote address at the state convention on Saturday. 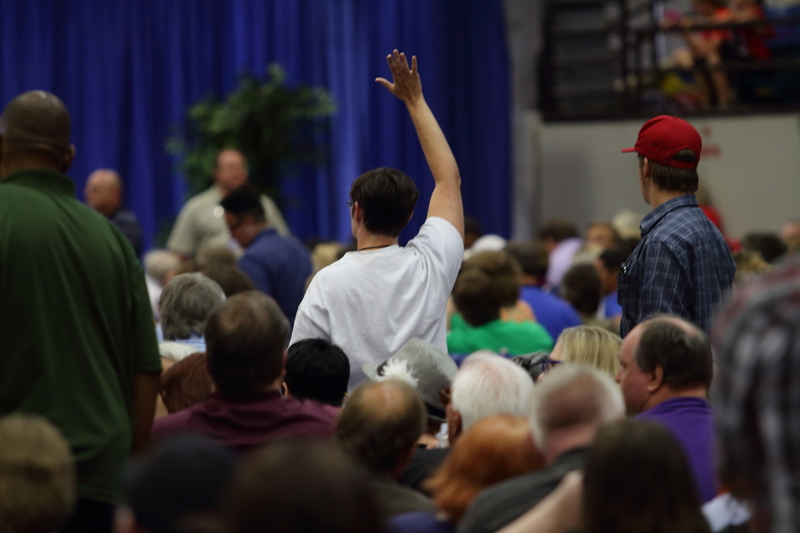 The crowd erupted at Merkley’s statement, with boos competing with cheers and applause…. Another proposed resolution to endorse both Clinton and Sanders failed…. I have attended Missouri Democratic Party state conventions since 1996, as a county delegate, as a Congressional level national delegate in 2000, as a county delegate and media in 2008 and 2016, and as media in 2012. I was a Bill Clinton county delegate in 1996, an Al Gore delegate in 2000, I supported Howard Dean in 2004 – and since his vote in Missouri didn’t reach 15% I wasn’t a county delegate, and I was a county delegate for Hillary Clinton in 2008 and 2016. In Sedalia, Missouri, at the state Democratic Party convention, delegate and alternate registration started at 8:00 a.m. and continued through 11:00 a.m. After that process any slots for absent delegates were filled by alternates for the respective Hillary Clinton and Bernie Sanders caucuses. Delegates were seated on the floor after noon. There were not a lot of representatives from the media covering the convention. The Hillary Clinton caucus had 321 delegates show up. The Bernie Sanders caucus had 453 delegates show up. Showing up is half the battle. Hold that thought. At the Missouri Democratic Party state convention in Sedalia – June 18, 2016. After the opening of the convention there was a motion from the Bernie Sanders caucus to replace the convention chair. There was a flurry of points of order. The convention chair explained that under the rules the state committee chair is the convention chair. That cannot be changed. Roy Temple, Chair of the Missouri Democratic State Committee and chair of the state convention. Bear in mind that the allocation of delegates to the national convention was determined by the vote in the March primary. That allocation does not change. Before the convention started we were aware that eighty-eight individuals had filed the paperwork to run as at-large delegates for Hillary Clinton (eight available national delegate slots) to be elected by the Hillary Clinton caucus at the state convention. Twenty-one individuals were on the list of potential candidates running as Bernie Sanders at-large delegates (seven available national delegate slots) to be elected by the Bernie Sanders caucus at the state convention. We were curious about the differences in numbers. At the point where the state convention was addressing the approval of the convention rules individuals in the Bernie Sanders caucus raised points of order. One individual from the Bernie Sanders caucus made a motion to open nominations for national delegate slots from the floor. In the discussion, the chair ruled the motion out of order, addressing the question of why only twenty-one individuals in the Bernie Sanders caucus were eligible to run for those national delegate slots. 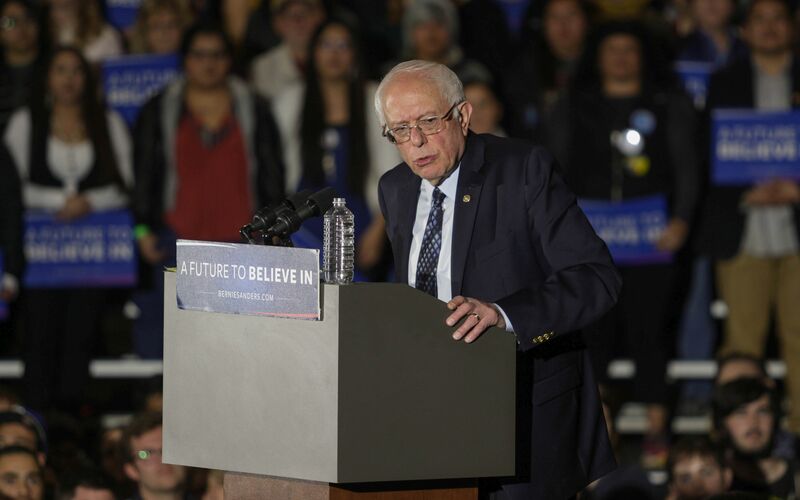 The explanation was that Bernie Sanders’ national campaign exercised their right under the rules, which are published and easily accessible, to strike names from the list. The Missouri Democratic Party did not have any say in those decisions. The chair of the convention also pointed out, in answer to the inquiry, that a failure to follow the approved delegate selection plan, overriding the right of a campaign to vet their delegates, could result in the unseating of the entire state delegation. We understood from various sources that the number of individuals removed from the list of at-large delegate candidates by the Sanders campaign was over seventy. It turns out those sources were correct. We explicitly asked a representative on the convention credentials committee if the Hillary Clinton national campaign exercised its right to remove any individuals from the list of those who filed as a candidate for at-large delegate. The answer was an emphatic, “No”. In attending and covering Missouri Democratic Party state conventions since 1996 I had not encountered such a large number of at-large delegate candidates being removed by a campaign. 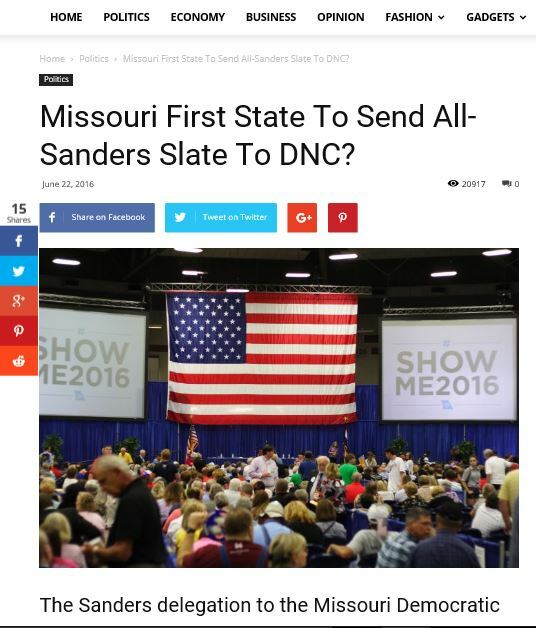 ….At the [Missouri Democratic Party state] convention it was reported that the Bernie Sanders campaign exercised its right to strike names of individuals from the list of candidates to be on the ballot to be elected by the Sanders caucus as at-large national delegates (7 positions). That right is stated in the rules which are published and readily accessible. Twenty-one individuals were on the ballot as candidates for those slots. I understand that a significantly larger number of individuals who filed to run as national delegates for Bernie Sanders were struck from the list. Over seventy. Is this correct? It is my understanding that all or most of those who were removed from the list were county/ward level delegates who had signed a Form B (pledging support to Bernie Sanders) and had submitted the forms to run as at-large delegates at the state convention. If they were county/ward level delegates for Bernie Sanders they would also be delegates for Bernie Sanders at the state convention. Why were those individuals removed from the list of at-large delegate candidates? Why so many? Were there criteria for doing so from the Bernie Sanders national campaign? If so, what were they?…. ….Missouri, like every state party, has diversity targets that each campaign is obligated to help meet. The review process helped us accomplish this. There are three types of pledged delegates: For the district level slots, we always allow all of our supporters run on equal footing. There also are slots are reserved for elected officials and party leaders. The at-large delegates are reserved for helping meet the goal of having a diverse delegation. Altogether, we received more than 100 applicants for the seven at-large delegate spots. We approved 21 names — three times the amount that we can send to the Convention. Our 21 approved names included a diverse group of applicants from all parts of Missouri. 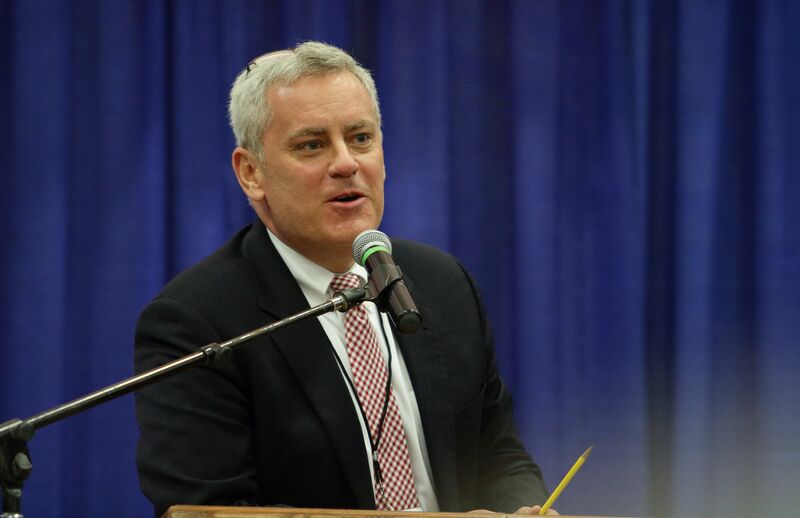 The list was winnowed after consultation with our state staff and volunteer leaders in the state, to ensure that the seven at-large delegates selected would help diversify the delegate slate…. Apparently there were some concerns that leaving candidacy for at-large delegate open to everyone would provide different results. A point of order from the Bernie Sanders caucus. There were points of order raised by the Bernie Sanders caucus during the consideration of the state convention rules. Ultimately a voice vote was taken, the chair ruling that the rules were approved. A point of order was raised by a member of the Bernie Sanders caucus contesting the convention chair’s interpretation of the ayes and nays. The chair then asked for the ayes to stand, then the nays to stand. 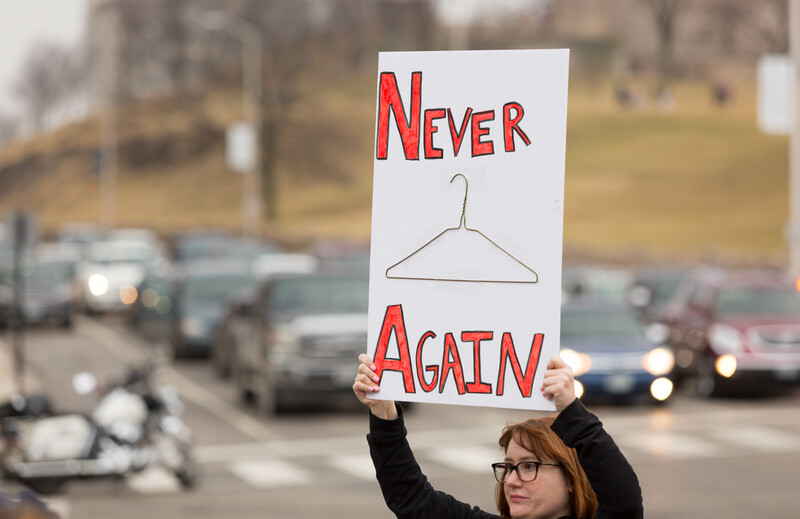 A majority from both caucuses stood for the ayes. This took time. Hold that thought. Another point of order from the Bernie Sanders caucus. The caucuses then divided (the Hillary Clinton caucus moving to another hall) to hear speeches from the candidates for the at-large delegates for their respective presidential candidates. After that considerable amount of time the voting for those delegate slots took place in the main hall. The nominating committee slate of ten Electors (the actual individuals who get to vote for president in Jefferson City in December if the Democratic party candidate triumphs in November) was approved by acclamation. At this point the convention had been going on into the early evening. The stream of delegates from both caucuses leaving the convention early accelerated, with a larger number leaving the Hillary Clinton caucus. Hold that thought. 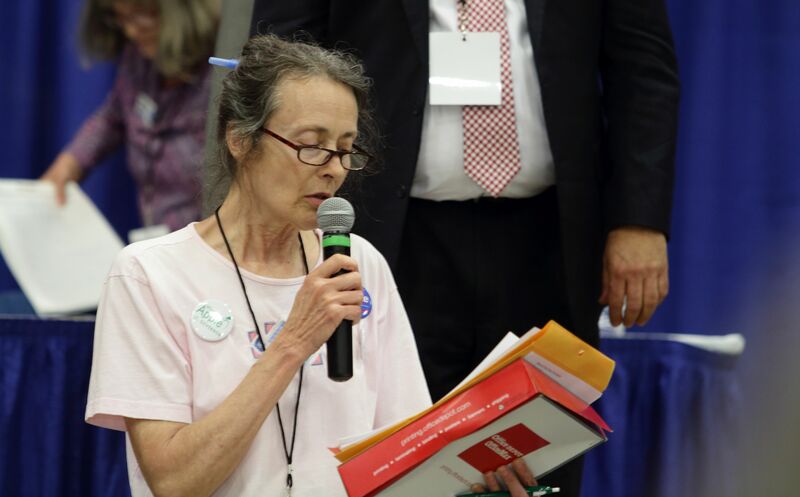 The nominating committee report for Missouri’s four Democratic National Committee slots, with four names provided by the committee, was open for nominations from the floor. 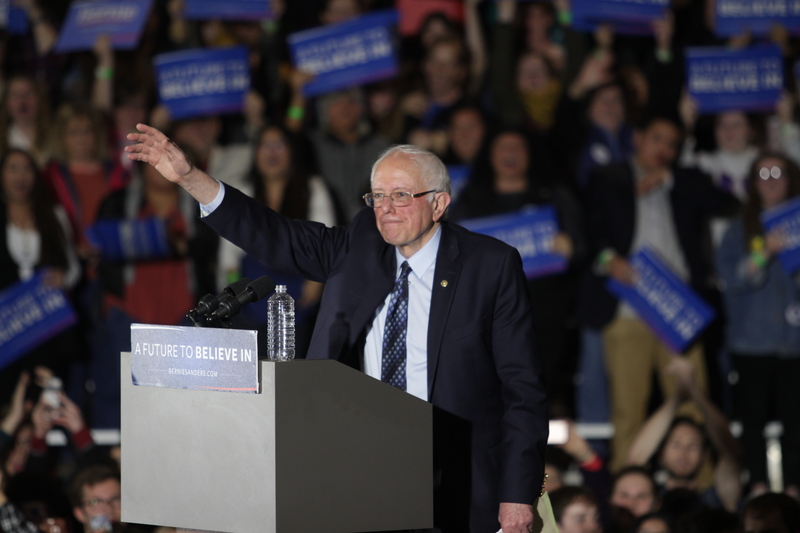 An individual in the Bernie Sanders caucus nominated a slate of candidates from their caucus. An individual in the Hillary Clinton caucus nominated one additional individual. The person nominated spoke to withdraw that nomination. The entire convention voted among the eight candidates to fill the four positions on the DNC. As the convention waited for the results of the DNC member election and after the resolution committee report was approved by acclamation, an individual from the Bernie Sanders caucus asked to be recognized by the chair. 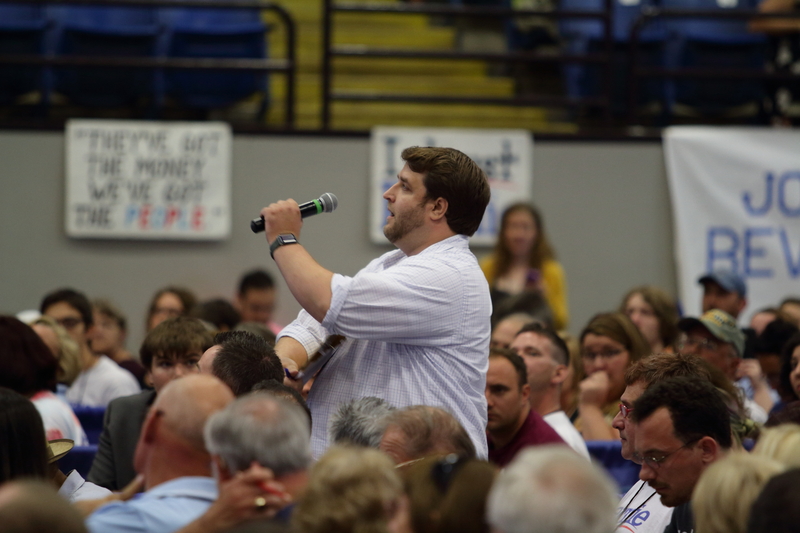 She walked to the front and proposed a motion, reading a condemnation of Hillary Clinton. An final attempt from a member of the Bernie Sanders caucus at a resolution to condemn Hillary Clinton. A number of state convention delegates, including several in the Bernie Sanders caucus, booed the motion. The motion was ruled out of order by the chair. The Bernie Sanders slate for the four DNC positions was elected. They bought the t-shirt, attended the rallies, showed up, and remained for the duration in sufficient numbers. Now that they’ve caught that particular car they’re going to have to figure out how to drive it. Yesterday various old media entities noted that Hillary Clinton has probably accumulated enough delegates to make her the presumptive Democratic Party candidate for president. Almost everyone else figured out that this was going to happen months ago. “Secretary Clinton does not have and will not have the requisite number of pledged delegates to secure the nomination. She will be dependent on superdelegates who do not vote until July 25 and who can change their minds between now and then. They include more than 400 superdelegates who endorsed Secretary Clinton 10 months before the first caucuses and primaries and long before any other candidate was in the race. Uh, unpledged PLEO (party leader, elected official) delegates can make their decision at any time before, during, or up to the point of the vote – that’s true. Though, interestingly, “Our job from now until the convention is to convince those superdelegates that Bernie is by far the strongest candidate against Donald Trump” is quite a change in attitude from a few months ago. Another interesting turn of phrase: “Secretary Clinton does not have and will not have the requisite number of pledged delegates to secure the nomination.” Uh, there is no such thing as “requisite number of pledged delegates to secure the nomination.” You just need 50% plus one of all delegates. WA state,Bernie wins caucus,where many can’t attend because of work. Primary w/open mail in ballot Hillary wins,w/twice the turnout.Rigged? Point well taken. Subtle, too. If I’m ever in a back alley knife fight I want Claire on my side. It’s all over except for the handwringing. ….Dedicated Democratic supporters that have dutifully paid their dues sneer in our direction, jest that we’re short-lived, and publicly doubt our convictions. “Bought the T-shirt, actually showed up” was the photo caption in our regional progressive newsletter highlighting the 4th Congressional District Convention. 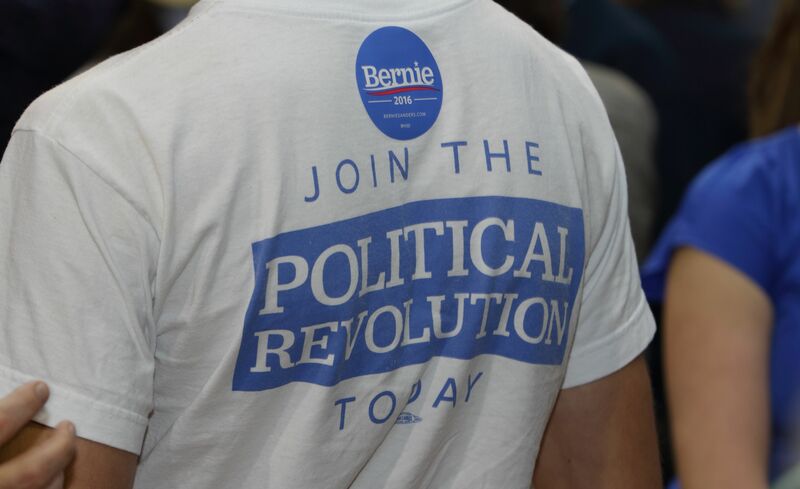 The photo depicted a man wearing a Bernie T-shirt. What they didn’t notice was Thomas Semkiw had given hours of his senior year in High School to phone bank, canvass, and rally. Thomas was reduced to a T-shirt and a snide remark. His identity, contributions and convictions had been obscured by entitlement…. Uh, we’re a blog. We ain’t no stinkin’ newsletter. It is nice to know you have read us at least once. Lighten up. Unless there’s something in a detail in the photo we missed like “My name is Thomas and I volunteered a lot” printed on the back of the t-shirt, who among our dozens of readers would know of our cruel disparagement directed at outing Thomas and his good works? Now they know because of someone’s social media handwringing. Uh, you were there, weren’t you? How is that not inclusion? Or is that excluding voices? Just asking. Well, okay, maybe you got us on the novelty part. Show up in 2016 and 2018 just to shame us for our oppressive sarcasm. I swear I’ve never felt elitist. Just stubborn and exhausted, but always still in the fight. Maybe those who aren’t in the true believers club should all roll over and play dead? Would that show sufficient respect? Just asking. Politics ain’t pattycake. I know from experience. 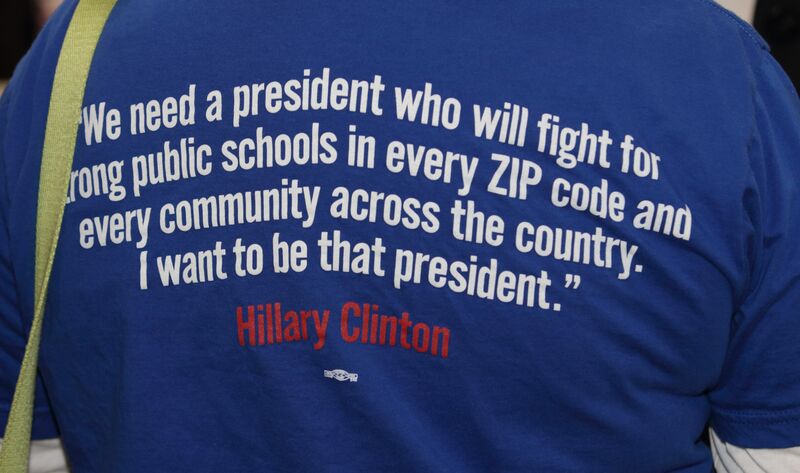 I have that 2003 vintage orange t-shirt (somewhere) from Indianola, Iowa as a reminder.